Artificial intelligence (AI) will play a significant role in the future of catering, but not at the expense of human beings, according to leading consultants and experts from the catering and FM industry. Hosted by bartlett mitchell, a panel of 20 experts attended a roundtable discussion to debate the current recruitment challenges facing the industry and the potential impact of technology and artificial intelligence on the workforce of the future. The panel agreed that, whilst AI could be seen as a threat by some to lower-skilled jobs, it was actually a real opportunity to enhance existing services and enable companies to offer better salaries, and more tailored solutions for customers and clients. All participants agreed that, as a service industry, there would never be a scenario where people would be completely replaced by machines. Instead, companies will look to utilise new technologies if commercially viable and not at the expense of human interaction. Wendy Bartlett, executive chairman, bartlett mitchell, said: “We are in the business of offering people experiences. Of course, it’s important to have amazing food, but service is vital – that makes the difference between success and failure. We see AI and technology as enhancing our service, not replacing people. She added: “We target clients who like that personal touch so there will always be a need for people. We can see how technology and advanced computing has moved our industry on over the last decade, and we are sure to see more significant developments in the future. It was also agreed that companies will need to see strong business cases to support additional investment in new technologies. Chris Stern, from Stern Consultancy, added: “Companies will have to be careful about where they want to invest. Technologies are moving so fast and it will take a brave business to invest in something without any long-term proof of success. What isn’t in doubt is that businesses need to continue to invest to enable them to grow”. The discussions were attended by catering and FM consultants, HR experts, FM directors. and bartlett mitchell senior management. 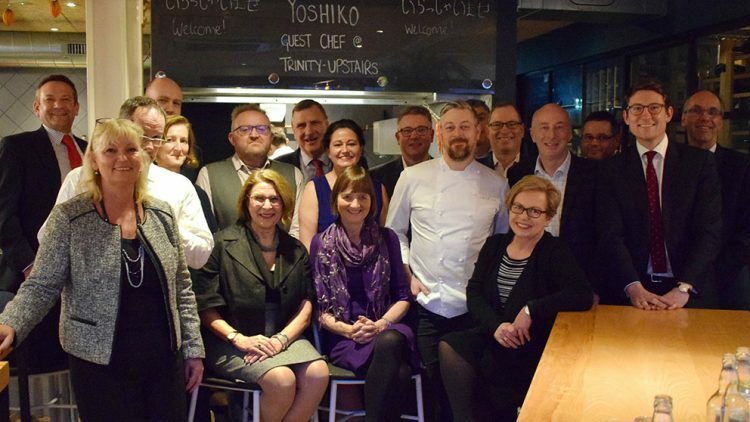 The roundtable event took place at Trinity, Adam Byatt’s Michelin-starred restaurant in Clapham. Adam Byatt is chef consultant for bartlett mitchell.